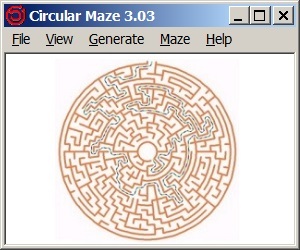 Circular Maze (cmz401.exe) is a Windows 7 / 8 program for creating mazes on paper. It draws random mazes in concentric circles, enjoyable for young children. The maze lets you pick one out of nine difficulties appropriate for the child. The mazes you create are royalty-free. Please purchase and download this program by hitting the Buy Now! button. The transaction is handled by MyCommerce / Digital River, a reputable company that has been in business for many years. To change viewing size, adjust the size of the window using the mouse. To generate a new maze, select size 1..9 maze from the Generate menu. To see the solution, select Solve from the from the Maze Menu. To make a printout, select Print from the from the File Menu. To save to a bitmap file, select Save from the from the File Menu. To exit the program, select Exit from the from the File Menu. This program comes with an installer and an uninstaller. To install, double-click setup_cmz302a.exe and follow the instructions. To uninstall, click Start Menu > All Programs > One Gram Software > Uninstall Circular Maze.